In the mid 1980s, before the community had been granted an official dog run, Tompkins Square Park was a dangerous place suffering from the ill effects of rampant drug use and crime that plagued New York. The founders of First Run were not willing to give up their place in the park and fought the perils of the day -- and City Hall! -- to establish a safe place to gather with their dogs. 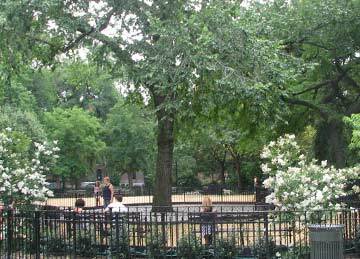 The city's first dog run was opened in 1990 as part of the renovation of Tompkins Square park. As ex-parks commissioner Henry Stern stated, "starting the run was just a good idea". The Parks Department included one caveat: the run must be managed and funded by the community (not the city.) Dog owners who fought so hard to make First Run a reality, raised money and organized volunteers. Today even those who have no love for dogs say that First Run was instrumental in bringing the park back to its glory days. First Run is a source of immense pride and devotion for countless people. In 2008, the dog park underwent a $450,000.00 renovation. "Friends of First Run secured the funding and shephered the design & renovation process with the support of the great Park Commissioner Adrian Benepe whose dedication has brought about the massive restoration of the entire New York City park system. Its many new features include a state-of-the-art running surface composed of decomposed granite sand, underground drainage, a large and small dog run, 3 swimming pools, picnic tables, as well as bath areas & hoses to spray off your dog before returning home.